What can you tell about a woman by looking at a mat she hooked sixty years ago or more? Quite a lot. You can tell that she had the strength to stretch the burlap across the wooden matting frame and to pull the loops of fabric through the holes. You can tell that she was resourceful by the scraps of outgrown children's clothing, men's work shirts and bed sheets that she uses, and sometimes dyes, to fill out the pattern that's been stamped or drawn on the burlap. You can see a hint of playfulness in the elongated whiskers she hooks on the face of a cat, or in the hot pink border she hooks around a traditional grouping of flowers. Her creativity and sense of design are also evident in the colour placement and style of the finished mat. If it was a mat for her own home, you'd know that she probably hooked it during 'matting season' the cold winter months that stretched from February to March when the fishery slowed and winter storms blew through the coastal communities. If it was a Northern scene, hooked low and tight, she might have worked for the International Grenfell Association's "Industrial," a cottage industry where women in Newfoundland and Labrador supplemented their income by hooking and selling mats in the early 20th century. 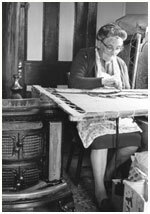 These qualities—resourcefulness, creativity, strength—aren't limited to mat makers, as the women of Newfoundland and Labrador focused their talents on a wide range of crafts. 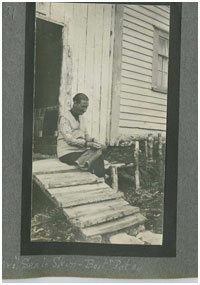 Witness Mrs. Patey, sitting quietly on a front stoop in St. Anthony, sewing the sole onto a sealskin boot. See four Inuit women working together to build a kayak in Hopedale at the turn of the century. 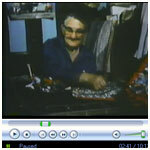 Watch Alice Boland at her spinning wheel in Ferryland demonstrating the process of making socks—from spinning the yarn to knitting the final product. Other women stitch and knit in quiet reflection, like Annie (Snelgrove) Roper in Bonavista, knitting by the piano, or the two nameless cross-stitchers in a brightly lit corner room in St. Anthony. We don't always know the names of the women who knitted, hooked, built and stitched the world together in the 19th and 20th century, but what we don't know, we can infer from images and from the work they left behind.